This is bad. Two of Coe Place's most vulnerable houses are listed on the MBBA-JER list of 1500 properties that were flipped a couple years ago by the City of Buffalo. I've been all over the larger story and created this "MBBA-JER social spreadsheet." It's searchable and contains the complete list of abandoned, partially boarded, derelict and presumably vacant houses controlled by MBBA. Those people in Albany control both 28 and 39 Coe Place which is next door to Artspace and Belmont Shelter. Earlier this year "friends of Coe Place" wrestled the Ward House away from Belmont Shelter's demolition list. They've seen the light and have now properly secured their house - right here - and word is they will rehab rather than demo the Ward House. 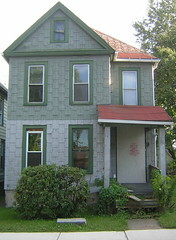 Any ideas how we can free both 28 and 39 Coe Place from Albany's callous grip? Let me know. George Grasser just sent out the August 2006 Partner's for a Livable WNY e-mail update. I'll continue to archive previous month's updates in the Partner's Archive. While pedaling along Seneca Street towards East Aurora and Elbert Hubbard's Roycroft, I spotted this yesterday afternoon. The big one that got away. It's located at the end of Emslie Street just a stone's throw away from the last stop on the Tour dé Neglect. In fact Sacred Heart, our last stop, is in it's present location because of the expanding Larkin Company's need for additional parking! More about that on Saturday, during the last leg of the Tour dé Neglect. 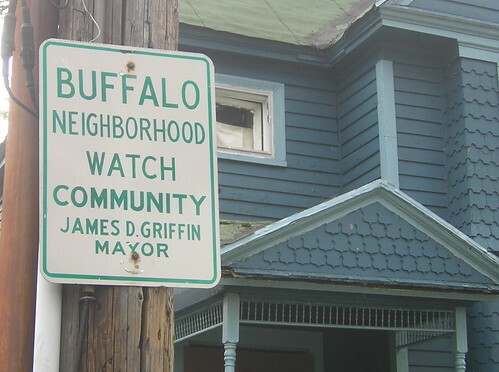 Here's a closer look at what I think is the City of Buffalo's newest historical marker. 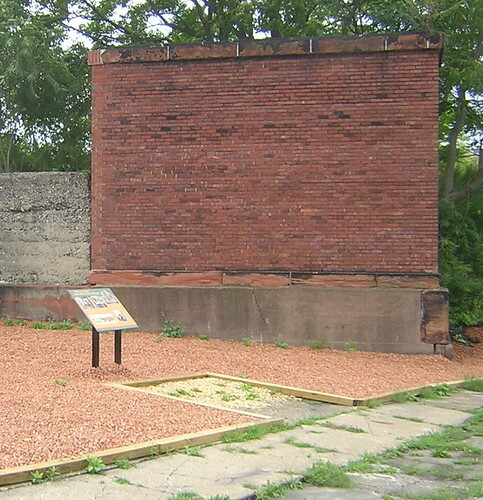 This photo shows the relationship - yellow bubble on the right - of the remaining wall to the entire complex. From Cynthia's work, I found this cool link to the Larkin Building and this one, about Larkin Soap bottles found in the strangest places. 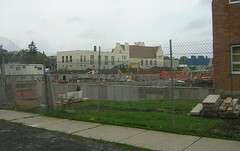 The pic on the left is the view from Woodlawn Avenue looking towards the new addtion dedicated to the visual arts. 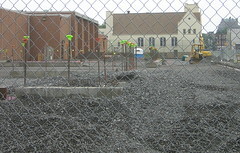 The forms were removed from the foundation this week and the site was back-filled. 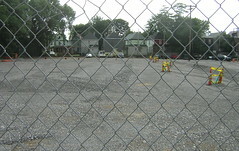 The pic on the right was taken on Masten Avenue looking West towards Bethel AMC Church. 800 West Ferry is there on the far right. This will be the new entrance to Performing Arts and the second floor of this addition will contain new practice rooms and dance studios. I asked Marc Odien, from WNYmedia.net, to record a recent session of On Target hosted by NYS Supreme Court Judge Penny Wolfgang. This particular show features retired City Honors English teacher, Chuck LaChiusa and local Buffalo teacher, Todd Mitchell. Listen and learn about various aspects of preservation in Buffalo and WNY. There are a few references to Chuck's Buffalo as an Architectural Museum, that I consult on a regular basis. Todd is helping to coordinate Buffalo Tours - 2006. Make sure to check out Chuck's photos...we'll be stopping by these spots on the last leg of the Tour dé Neglect, next Saturday. update 10:38pm....here's a set of interior photos from late last year. Check out the various shots - porch, backyards and houses next door. Here's the map and proximity to Mayor Byron Brown's residence, near Canisus College, just down the street. When I peeked over the fence, into the neighbor's yard, I felt like I was visiting some of my favorite Allentown neighborhoods. Yesterday, I noticed that the Mayor's Impact Team must have been around. The entire yard was cleaned out, including the decorative wrought iron gate and fence that adorned the side yard. The stenciled writing on the boarded front door makes this place a no-go for the casual explorer. That stencil is a court order recently issued by Housing Court Judge Nowak to keep people away. It's an 'order to vacate.' You will be arrested. Your best bet is to try to track down the owner, Paul Ensign. Housing Inspector Rich Balestiri wrote 1572 Jefferson for Housing Court - Index# 1925/2005 - last year. In November 2005 the case was adjourned and recently in February Judge Nowak was trying to find the owner, too. Next Housing Court date is September 30th. Checking out the City's property description it appears as though Paul Ensign purchased this house from the City in 2002 for $15,000 at the tax auction. If you're interested in pursuing this - no sluming now - we are thinking owner occupant this time, let me know. I might be able to help negotiate a few obstacles. Looking at the Housing Court file - Index# 1925/2005 - it appears as though Judge Nowak is pushing demolition. Wish my check book was bigger than my toolbox! 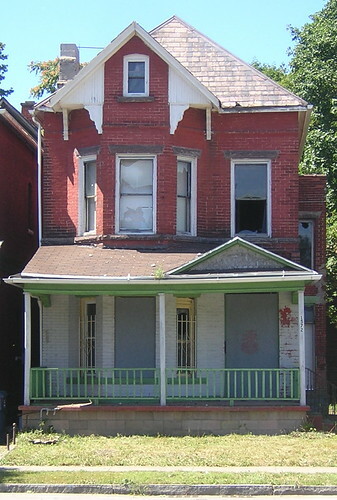 This three bedroom single family home at 70 Riley Street is another 'demolition by neglect' candidate. Must be contagious as it's less than 100' away from St. Vincent's. Here's the map and proximity to Artspace. 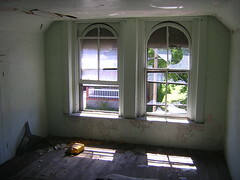 The curved window frames are unique and always seem to appear in Buffalo homes that were built a few decades after the Civil War. 70 Riley won't last long much longer. 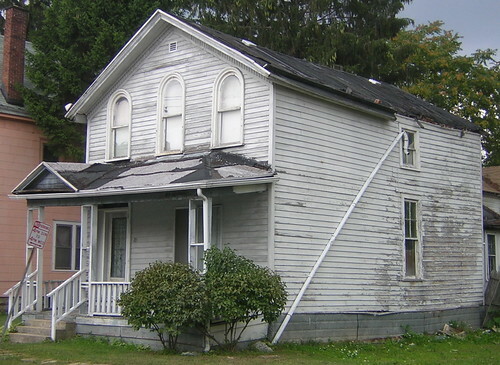 Portions of the roof are missing and the soffit on the right side of the house has collapsed. When I took a closer look at 70 the other day it appears as though the right side of the house is bowing out where the water damage is also causing the clap to fail. 70 Riley Street is privately owned and sits alongside a few homes that are well maintained. Less than a block away, 93 Riley is still owned by the City of Buffalo. I first wrote about it, here last January. And here, in February. Yesterday I noticed the Griffin sign was still up in front of 93. The street is one of the oldest corridors in the Midtown district, laid out in 1859 in commemoration of the death six years prior of Major General Bennett Riley, a prominent Buffalo citizen whose ample frame house existed at Main and Barker streets. General Riley, an important figure under President James Polk during the Mexican War, was a native Virginian and a veteran of conflicts dating back to the War of 1812. His leadership in the Mexican War laid the foundation for America's acquisition of California, over which Riley was later military governor and was instrumental in its attaining statehood. In 1849 his retirement brought him to Buffalo, a place of which he was very fond, and died shortly thereafter in 1853, leaving behind a substantial collection of antiques. To this day, the Historical Society retains Riley's hat, epaulettes, and two gold-hilted presentation swords as memories of his late love affair with Buffalo. In addition, Ft. Riley in Kansas is named after General Bennett Riley. It was the all-black 9th and 10th calvalry regiments, the so-called 'Buffalo Soldiers' that were stationed at Ft. Riley during much of the 19th and early 20th century. btw...has anyone seen Byron signs like that around the City? Any Makowski signs still up? Guess I'll have to wait 'till September 9th to get a look at what's happening inside. From the windows, looks like the building has been gutted. And you can see from these pics that the big dig is now filled in. btw...finger's crossed that Artspace managing partner - Belmont Shelter - will clean up the City owned empty lot at 17 Coe Place before the party. They dumped all over it. Check it out. Would be the right thing to do...don't you think? As of earlier this evening all the debris was still there! 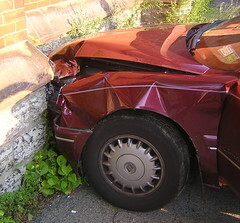 update...9/1/06...debris is still there. Spoke with a few "friends of Coe Place" today. We're planning a few very creative signs if Belmont Shelter doesn't fix this! 1093 is located one block away from rapidly developing Artspace and sits at the same intersection with these two stunning late 19th c. Midtown Victorian homes. Remember, solid places on the City's near East Side are going fast. List to sell is quick. These two just sold recently in the Artspace and Performing Arts Impact Area. Here's the map and proximity to Artspace. Call Melody Baldauff, listing agent for Hunt, now...603-9879. You know it's not going to last! Not sure about the area? 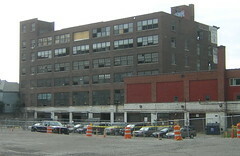 Check out Chris Hawley's - Midtown: Poised for Renaissance - then call Melody. Saw Daniel Shanahan Thursday afternoon at the café. He reminded me that Torn Space Production's Terminus is this weekend...at the Central Terminal, last time. Please consider upgrading your Web browser. Internet Explorer doesn't properly support CSS Standards - important for a good web experience. If you visit fixBuffalo with Firefox or Safari, it works perfectly, otherwise most pages are totally skewed. Buffalo's own BRO recommends upgrading to Firefox for a better experience visiting fixBuffalo and everywhere else. I've been using Firefox for the past 18 months. Love it. The extensions, tabs - everything. I even have portable Firefox on my 5.0 gb Seagate flash drive that I take with me wherever I go - cafe or school. I've recently learned that 59% of fixBuffalo visitors are still using IE. You should switch. It's that simple. So many sites, including fixBuffalo are designed and support firefox. If you can't do it at the office, do it at home and put portable Firefox on your flashdrive. Background here, here and here. I posted Midtown Masterpiece back in March. Make sure to check out Chicago architect and BRO contributer David Steele's piece, This Building Must be Saved...great comments. Bob can be reached here. Remember RUN Buffalo? I posted that two months ago. David Bruce is President of RUN Buffalo. David is also President of Bruce Builders, Inc., a design, construction, and development company doing business throughout Western New York. David and his wife Joan live in Orchard Park. Joan Bruce is Treasurer for RUN Buffalo. Joan is the Store Manager for Wegmans Food Markets on McKinley Parkway in Hamburg, New York. David Brody is Secretary for RUN Buffalo and a member of the Board of Directors. David is an attorney practicing real estate and business law in Williamsville, New York. Michael Mullaney is Vice President of RUN Buffalo and a member of the Board of Directors. Michael is the Store Manager for Wegmans Food Markets on Sheridan Drive in Williamsville, New York. Ralph Giambra is a member of the Board of Directors. Ralph is President of Hi-Tech Services, Inc., a computer services company serving corporate and municipal clients. 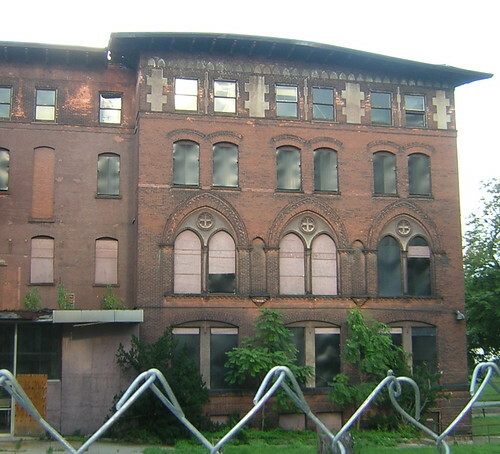 Run Buffalo claims there are 22,000 abandoned and vacant structures in Buffalo, NY. I've also heard from the people on the 9th floor of City Hall - Planning Dept. - that there are 95,733 parcels of property in our City. 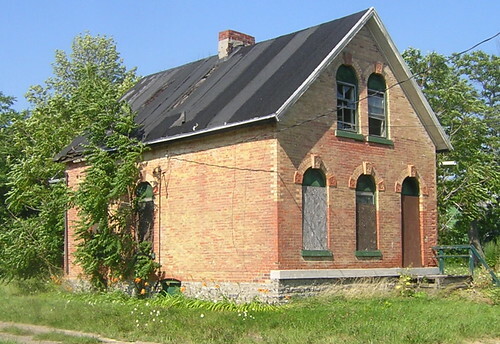 We know some of those are vacant land - subtract for the empty lots - and do the math. 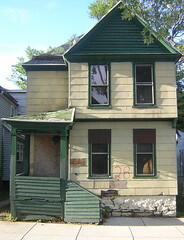 More than 25% of the property in the City of Buffalo is abandonded and vacant. One out of every four! MBBA was in town on Tuesday to discuss and possibly fix the problem associated with their control of 1500 abandonded, partially boarded, derelict and mostly vacant houses in Buffalo, NY. 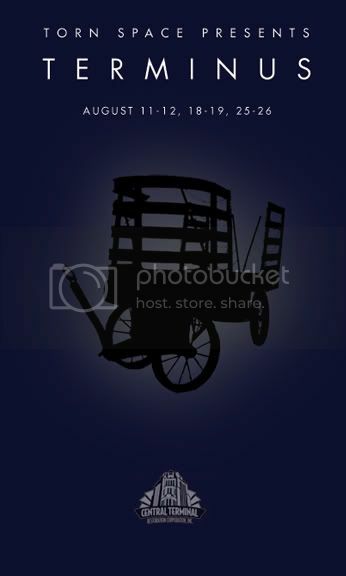 Background is here and here. I know at least two fixBuffalo readers were there. What happened? 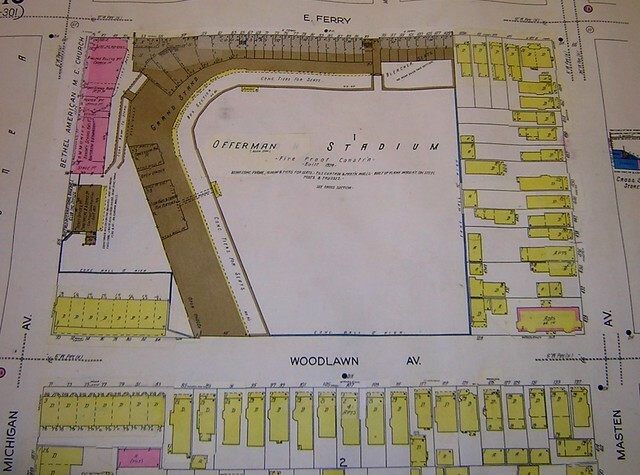 While visiting Central Library recently, über librarian Cynthia Van Ness, showed me a file she had recently updated about Offerman Stadium where the Buffalo Bisons used to play to sell-out crowds of 12,000 adoring fans. I certainly didn't expect to find a reference to my own research about the neighborhood - thanks Cynthia - I did have the opportunity to read through Lawrence S. Ritter's Lost Ballparks (1992) and his chapter on Offerman Stadium. And not until I started reading Buffalo sports historian Joseph Overfield's April 19, 1975 feature length Buffalo News article, "Remember Bison Stadium" did it even occur to me to ask, "What was here before Offerman Stadium?" Reading Overfield's and Ritter's work lead me to this...another baseball park! 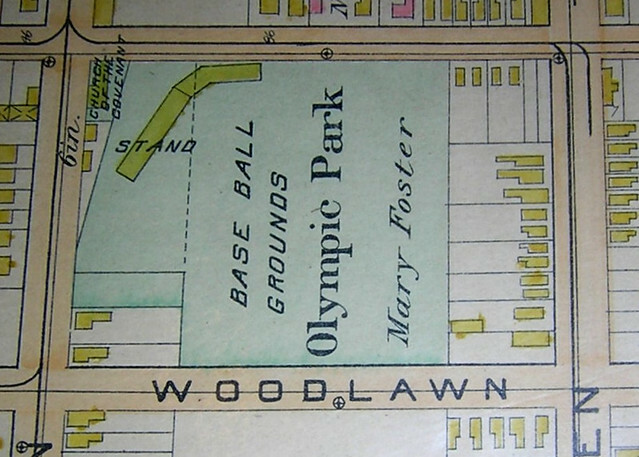 Olympic Park was built in 1889 and was home to the Buffalo Bisons. This image is from an 1894 map. 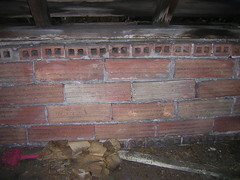 Click image for additional information. This image is from a 1926 Sanborn map. Click image for additional information. Olympic Park arrived on the site in horse drawn wagons from the City's rapidly developing West Side. Joseph Overfield's work includes a short piece that appeared in the Buffalo Historical Society's Niagara Frontier in 1955 describes this process. When Baseball Came to Richmond Avenue, tells the story of Buffalo baseball on the City's West Side and its connection to Olympic Park and the move to the City's near East Side. From - When Baseball Came to Richmond Avenue by Joseph Overfield, 1955. Deeva over at the716.com has an incredible eye for capturing scenes of Buffalo's less travelled East Side. I posted Deeva'a first East Side View the other day. 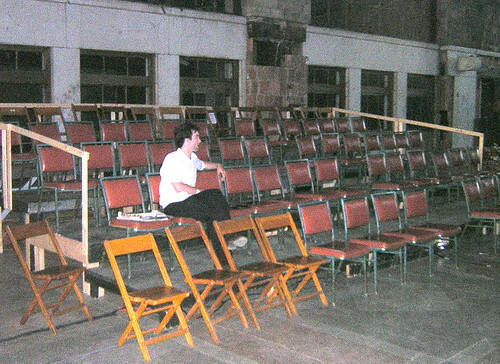 St. Mary of Sorrows was scheduled for demolition back in the 90's. Bob Kresse challenged the Bishop's plan and today the King Urban Life Center Charter School is thriving in this spot. Had a tour recently. Here's a shot of the church and story & history about St. Mary's and the King Urban Life Center. 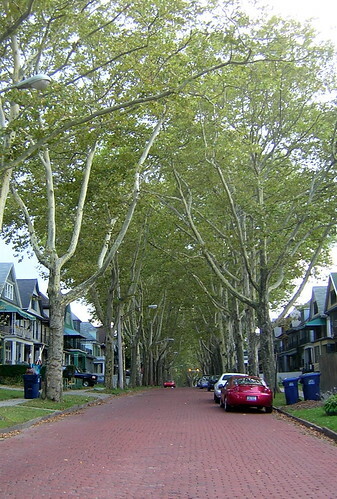 Last month over at BRO, David Steele wrote about the trees over on Timon Street, right here. This afternoon John Paget and I stopped and snapped a few pics of this totally fabulous street. This shot is looking north on Timon at Dodge Street on our way to the German Roman Catholic Orphan Home, a few blocks away. Good news - a well qualified Buffalo resident contacted me last week and wanted to more about Lyth Cottage. He's interested in buying 16 Harwood Place from the City and making it his home. In case you missed it, here's the story behind Lyth Cottage. We took a closer look Monday afternoon. 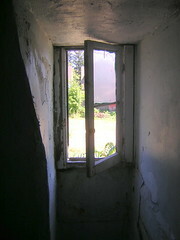 No plumbing or electric, which you got to expect when a place has been left to rot for nine years. 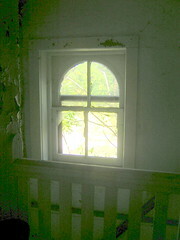 I was struck by the simplicity of the cottage's interior and how solid the house felt despite the years of neglect. Love the windows, especially the lower right on the second floor. 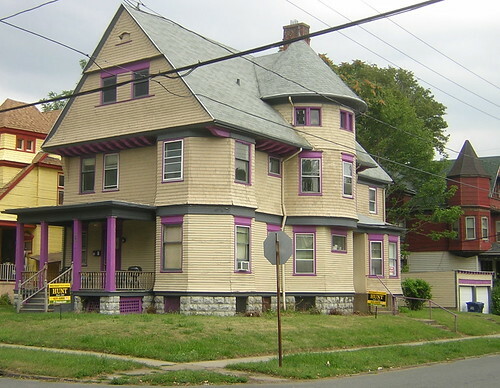 I'll keep tabs on the purchase of 16 Harwood Place in the weeks and months ahead and document the process of buying a house from this owner, the City of Buffalo. Architecture question. What's the name of the stone, running the length of the first floor, just above the foundation? Saw the same feature on various houses later this evening on Mariner just south of Allen Street. John Paget was totally wowed by St. Vincent's, this afternoon. First time I've seen the back of the building - access from Literacy Volunteers parking lot - in a few weeks. First time I've seen this roof wave...goodbye. Compare this pic to the first pic in Midtown Masterpiece that I posted last March. Looks like this soffit will be joining the two on the Ellicott Street side that collapsed here and here recently. 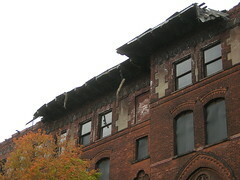 Check out the comments at - St. Vincent's Death Watch - if you are at all interested in helping to restore this building. While on tour this afternoon we approached Transfiguration and saw Buffalo's finest arriving. Cops told us that he thought he was being chased. Maybe he didn't know the church was closed. This is what it looks like, on the inside. And while Transfiguration was never intended to be a drive thru church, looks like the latest dioscesan abomination over at Hickory and Eagle could have a drive thru lane added. We saw the lights on and parishoners inside Buffalo's newest McChurch! Lots of construction pics over here in Annals of Neglect. When will Bishop Kmiec, who still resides at 79 Oakland Place - and from what I've gathered doesn't plan to give it up - announce the list of closings that he's been keeping in his desk drawer? Here's the latest from last week's Buffalo News - WNY Catholics Struggling With Church Closings. The Bishop's Journey Through Faith and Grace to Avoid Housing Court is going to devestate the City's East Side. Just like it did back in the mid 90's when Transfiguration was flipped to local attorney and Housing Court scofflaw, William Trezevant. He still hides behind his mother, Pauline Nowak - full story here - with Housing Court index # and inspection history. 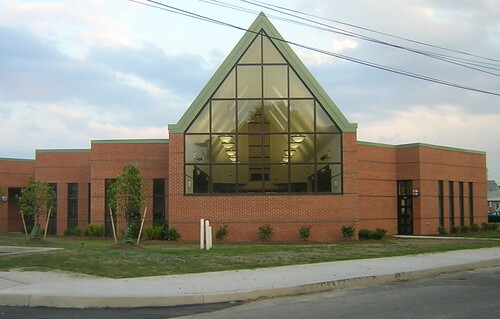 Anybody know what's going on with the former Villa Maria High School that just closed? Jim Ostrowski reported on that development in December, right here. Had the unexpected opportunity to drive around the East Side today with John, from Paget Films and a few friends. While the sky was threatening we put the top down, shot video and stopped along the Tour dé Neglect route. Check out the excellent slide show via Flickr with pics tagged 'Central Terminal'...160 awesome views. The Central Terminal Restoration Corporation has a growing list of events. We'll be stopping by on Septemeber 2nd for the last leg of this season's Tour dé Neglect. I noticed a few more pieces ready to fall from St. Vincent's this afternoon. That's in addition to this chunk that fell last week and this other chunk last month, that prompted the City to erect a faux sidewalk barricade along this stretch of Ellicott Street. The barricade, for practicle purposes is no longer in place...the tape blew away. I posted Midtown Masterpiece back in March. Make sure to check out Chicago architect and BRO contributer David Steel's piece, This Building Must be Saved...great comments. It's official. The St. Vincent's death watch is on...I say it won't make it through the winter. Time off last week. No week 7, sorry. Judging by the frequency of the dumpster schedule seems like lots of stuff is happening on the inside. Just missed picking up a set of deco plywood auditorium chairs. 800 got trashed. Managed to pick up about 300' of maple trim and a 2" thick plain maple door. It's 38 X 84. I'll mill the edges add some brushed stainless pipe and have a new dinning table. Anyway, on the outside the third foundation, for the new science wing is well underway in the lower right pic. I imagine by the end of this next week the forms will come off on the other two additions. The construction fence seems to holding and is properly secured just like at Performing Arts sister site, over at Artspace.